Cunning, smart, powerful, ruthless and sleep deprived, the Adminotaur is a boss monster who was promoted from being a simple minotaur due to its skills as a dungeon administrator. A lot of dungeons supervised by an Adminotaur tend to obtain better results than others in key performance indicators of economics, adventurer extermination and cleanliness. 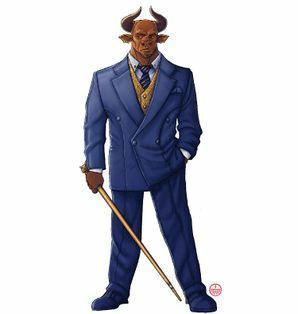 Records show that the Adminotaur is as smart and cunning as a demon, luring its foes to traps and sweet talking tax collectors. Its power is not to be underestimated either, since he can easily wipe a full team of trained heroes by itself, or torture them to the brink of death by inhuman means like chaining the heroic adventurers just a few centimeters away from a tank of delicious beer. On a side note, it's rumored that his administrative efficiency and listening talents often get the Adminotaur positive performance reviews from co-workers and underlings — except for those that make the mistake of angering this normally calm boss monster, according to the only Adminotaur diary found. 1.1 Daily Diary of Dungeon's Administration -Day 176- 2702 g.e. Little is known about the exact way the Adminotaur manages a dungeon. That's why, when a party of heroes managed to get a hold of a single page torn from a Day-to-a-Page Diary from the corpse of the dangerous boss monster, a lot of wealthy people and a lot of Godville organizations made offers for the precious information. It was ultimately the Godville Times that managed to grab the prize, and they decided to publish copies of the diary. It quickly became one of the all-time best-sellers across the whole of Godville, despite being only one day's worth of information about the Adminotaur. Daily Diary of Dungeon's Administration -Day 176- 2702 g.e. 01:12AM: Woke up to the dungeon alarm's sound, adventurers spotted in the dungeon. 01:23AM: Got back to sleep after the party reached the exit door in 21 steps by going in circles in the dungeon foyer. 03:55AM: Woke up to the dungeon alarm, adventurers spotted in the dungeon. 04:04AM: Diary entry not found. Heh. 04:06AM: The party reached the exit door in 21 steps by going in circles in the dungeon foyer. Sent a worker to install a new directional hint before getting back to sleep. 06:30AM: Alarm clock went off. Night was too short. 07:03AM: At the office, making a start on some admin. The paper pile only measures 58cm today. 07:13AM: Interrupted by another heroic intrusion. Paper pile was at 45cm. 07:57AM: The party has been dealt with by that poison arrow trap. Got the janitor to throw them outside and sent the cleaners and the engineers to clean up and reset. Only 2 casualties in the staff today so far. 08:03AM: Got back to office. Paper pile is now at 68cm. Only cried for 3 minutes. 08:17AM: Interrupted by a call from the Godville Times. Gave them a short interview before getting back to business. Paper pile is at 63cm. 09:12AM: Managed to clear out a lot of papers. Pile is at 33cm. Gonna need at least 5 minutes to read that illegible doctor's note. 09:17AM: Actually had to call said doctor to find out what he wrote. 10:35AM: Incident in the barracks. Two monsters wanted to see what happens when you feed a beer-scented soap to a Beerkat. Result is a goddamn mess, a long call to the insurance company and another pile of paperwork for me. Now at 45cm. 10:39AM: Dungeon alarm rang. Heroes again. 10:42AM: Party shows no sign of life or death or whatever. 10:57AM: The "heroic" team was actually found in the beer-soaked barrack, totally smashed (both the barrack and the heroes). Back to business and to the 36cm of paper. 11:53AM: Managed to reduce the paper's pile to 23cm. It's lunch time! 12:01PM: Some Boozerker mistook "lunch time" for "launch time" and threw a Beardless Dwarf across the lunch hall. Third staff causality of the day. 12:42PM: That was a good lunch break, without a single fight... Oh, wait. 12:53PM: Eight more staff casualties in that food fight. Killed most of them myself for wasting food, though. 01:15PM: Nap interrupted by a false dungeon alarm caused by a giant mouse. 01:20PM: Back to business. 55cm. 02:01PM: Received the staff's union in my conference room. They're pushing for less dangerous work conditions and more green spaces. Only killed two of them this time. Back to my 78cm pile... Crying for a full minute. 03:07PM: Met with the tax collector for more than an hour. Managed to sweet talk him and gained a 50% reduction without having to threaten him to death. 01:33PM: Tried writing a fake earlier time in the diary to see if it changes the real time. It doesn't. 04:15PM: Finally... cleared that pile. 0cm. 04:16PM: First heroic party of the afternoon. 04:27PM: The party reached the exit door in 21 steps by going in circles in the dungeon foyer. Going there myself to see what the hell is going on. 04:33PM: Put the fallen-down sign back up correctly and impaled the sleeping worker on it for good measure. Fourteenth staff casualty of the day. 04:34PM: The dungeon's bell rang while, and I turned to face the terrified team of spelunkers. Finally, a little workout to ease some stress. 04:35PM: I may have... overdone it. Called half of the staff in to clean up the mess before going back to the office. Sighed when I saw a full meter of paper. 05:27PM: Took a break in the cafeteria. Listened to an employee complain about his wife for half an hour before going back to work. 06:59PM: Finally done. Knocked my secretary out cold to be sure he doesn't put any more paperwork on my desk. 07:32PM: Had dinner in deathly silence. Still have to get the bodies from lunch removed from the cafeteria. 08:00PM: Time for my daily poker game with the Dungeon Keeper, Bluffalo and the Flawyer. 08:17PM: The dungeon's alarm rang for the entrance of another new team of dungeon raiders. Not gonna stop the game for that. 09:00PM: Took a break from the game and I decided to pass by the treasure trove. Bumped into the unlucky adventurers. Accompanied by a crescendoing thunder of timpani, the Adminotaur makes his appearance. This page was last edited on 21 January 2019, at 17:43.